What I learned seeing Walt Disney World in a wheelchair - Kellbot! | Kellbot! Disney wheelchairs are not in great shape. The second one we got was OK but the first one veered so heavily to the left that it was nearly impossible for me to push straight by myself. Disney wheelchairs are not designed to be powered by the occupant. Yes, they have those big wheels so you can in theory wheel yourself around. In practice this is nearly impossible for more than a few feet. First, the chairs are entirely too wide. I felt like a gorilla reaching out for the wheels. Second, the handlebars in the back (so someone can push you) get in the way of anything resembling a smooth motion. Having to rely on someone else to push you around is frustrating no matter how much you love them and how awesome they are. None of this was even remotely surprising to me as I have heard it all before from friends with disabilities, but it was still interesting/aggravating to experience first hand. I was reminded of an article I read last year called “how to illustrate wheelchairs.” It explains that the chairs you see in the hospital, and Disney World, aren’t the sort of things anyone would use regularly to get around. 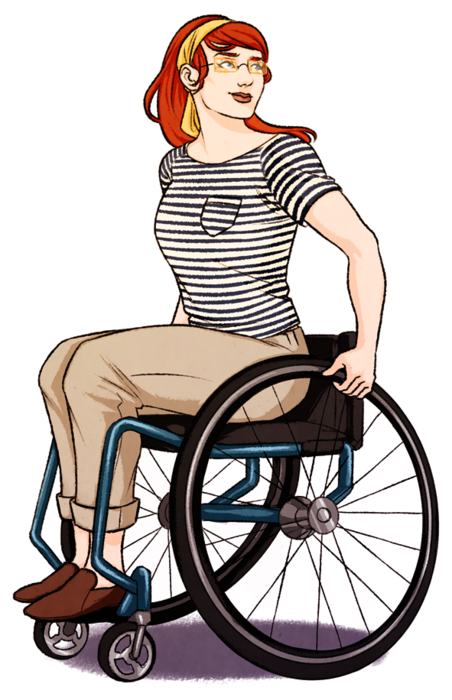 Something like this is more what I would have wanted to use, but obviously that’s not what the average Disney wheelchair renter wants. I was curious if any of the off-site rental companies offered something a little more maneuverable. While some of them offered narrower chairs, they were all hospital-style. It looks like the popular option for most people who want independence is an ECV (aka scooter). The expense and size of those made them pretty unappealing to me – getting one from park to park on the buses is routine but it takes a little while to secure/unload. It would have been a lot to deal with while travelling with a toddler. They also just seem a lot less nimble than a chair. I could spin around in place in the wheelchair, which is handy when you’re watching your kid zoom around a playground. There’s so much walking necessary in Disney World that even minor mobility obstacles can become big ones. Now that I’m home I’m getting around just fine – as long as I stay off my foot most of the day it doesn’t bother me. But at Disney I was on my feet 8-10 hours per day and it hurt. I’m guessing there are a significant number of people who decide mid-trip that they can’t deal with the walking anymore. Lastly: no I did not get to go to the front of lines (nor did I ask to). Aside from the fact that I was absolutely capable of waiting in line like everyone else, Disney has recently(ish) changed their policies due to rampant abuse. Now instead of going to the front of a line Disability Access Service Card holders get a fastpass-like service allowing them to pass their wait time somewhere more comfortable.